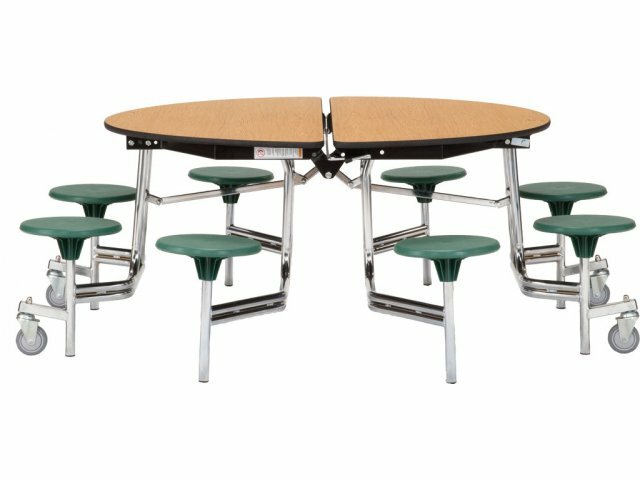 Round cafeteria tables create a cozy and intimate feeling in your lunchroom. Eight stools encourage small groups of students to enjoy meals together. These round cafeteria tables have stools which are ideal for older students. The high-impact reinforced stools give each individual a clear personal space at mealtimes. They also make it easy to get in and out without having to step over anything or squeeze in somewhere. With secure attachment to the sturdy steel frame, stools are a reliable and comfortable choice for your lunchroom. When it comes to stability and convenience, this cafeteria table is a real winner. A torsion bar system allows the table to be opened and folded by just one person. 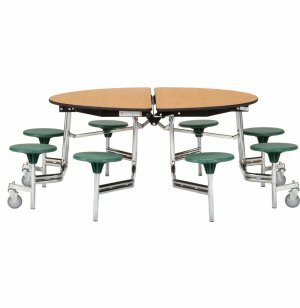 These lunchroom tables automatically lock in the open and fully-folded positions, and can also be locked in the partially-folded position for easy cleaning. When the table is fully opened, the heavy-duty casters lift off the floor and do not extend beyond the surface in order to prevent tripping.